You may want to specify that ingredient as Bob's Red Mill Gluten-Free Biscuit and Baking Mix. They have other mixes with similar names and none of the others are gluten free. Crispy Fried Chicken and Cornbread Waffles served with honey tabasco sauce will have your taste buds do a happy dance. Dunking the chicken, and waffle (all in one bite!) into the sweet and spicy sauce brings out so many flavors. 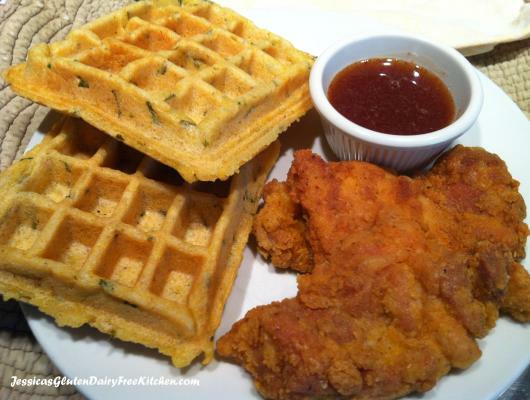 Savory waffles with fried chicken will surprise you as to how good this combination is. Yes, gluten free, and dairy free can be quite fantastic.